Holder of a Degree on Political Sciences and Administration from the University of Athens and a MBA of Sales & Marketing from the University Institute Kurt Bösch , his career was launched in the Sales Department of ET BETON, Italcementi Group in 2003. In 2013, he assumed the position of Innovative Products Sales of Halyps Cement, Italcementi Group. 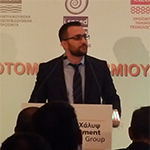 Effective December 2015, Mr. Kotsikis was officially appointed as the Concrete & Innovative Solutions Sales Manager of Italcementi Group Greece. In this keynote, a review of the situation is made dealing with the photocatalytic cement-based materials and their current applications in the building sector. Special attention will be dedicated to depollution & self-cleaning performances of cementitious products.